Welcome home to this immaculate âone-of-a-kind, â Princeton model in Bridgewater! With 4 bedrooms, 2 baths, heated salt-water pool, and 3- car garage this home is perfect for anyone. From the moment you enter, you will notice the beautiful plank wood porcelain tile that flows throughout the living space. The large chefâs kitchen features 42â linen glazed cabinets, granite counter-tops, S/S gas range and appliances, and breakfast bar. Enjoy gathering in the spacious great room that leads to the travertine-tiled lanai and gorgeous custom pool that overlooks a tranquil preserve. Retreat to your oversized master suite with large walk-in closet, bathroom with double sinks, soaking tub and separate shower. Additional home features include tray ceilings, crown molding, designer lighting, and surround sound wiring. Bridgewater is a MAINTENANCE-FREE gated community that is centrally located to shopping, dining, A rated schools, and medical facilities. 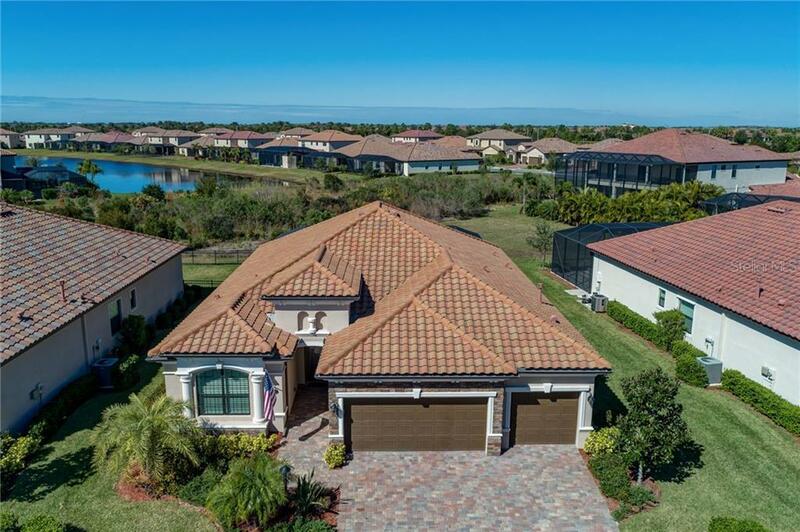 Lakewood Ranch offers residents everything for the Ultimate Florida Lifestyle with championship golf, tennis, fitness facilities, polo club, parks, walking trails and so much more. Check out the posted 3-D tour for a glimpse of this MUST SEE home!